This is a neat initiative. 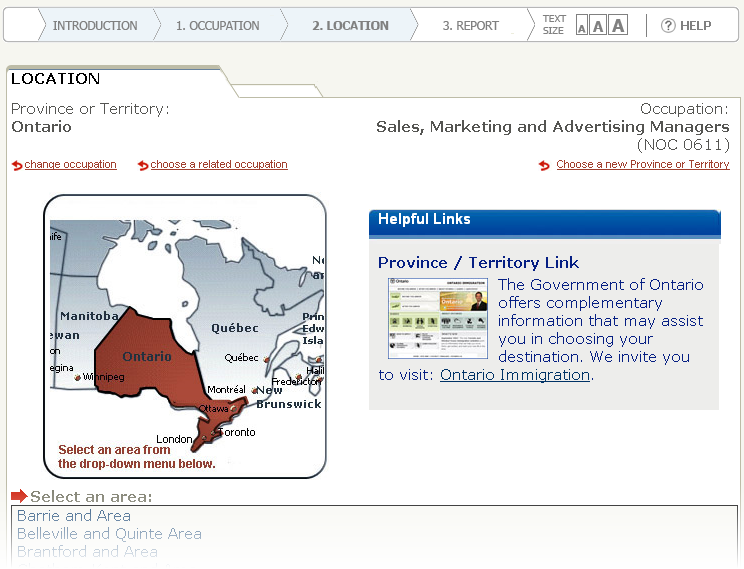 It’s a webapp that’s aimed at helping new Canadians make informed decisions about where to live and work. Put together by HRSDC. Users enter info on the profession they are interested in and the geographic location they want to investigate, and they receive a grab bag of useful info. Here’s a screen grab at the “choose location” step. Even though this is aimed at newcomers to Canada, I could imagine it being used by anyone considering a move within Canada too. F’r instance I was able to find out that people in the marketing communications world make more or less the same in Montreal (average salary: $28.33/hr) and Ottawa ($28.70/hr), and this is slightly lower than the national average ($29.97/hr). I might have to play around more with this to figure out where I need to move to! To make the whole thing work, the app pulls data from a wide variety of govt sources. The aforementioned job bank, but also labour market information, the NOC job classification database, the CMHC, and more. See the app’s About page for the full list. Pretty nice example of pulling together info trapped in widely spread out databases and making it work to improve government services.